The Attorney for the Town of Morningside has stated in response to a Public Information Act Request that Morningside is not the "operator" of the speed monitoring systems it runs and that it does not maintain any calibration records or daily setup logs for their cameras. 1) The annual calibration certificates for ALL speed monitoring systems used by Morningside during any portion of 2011, 2012, or 2013. Please note that transportation article 21-809 requires annual calibration certificates for speed cameras to be “kept on file”. I am seeking both current AND expired certificates. 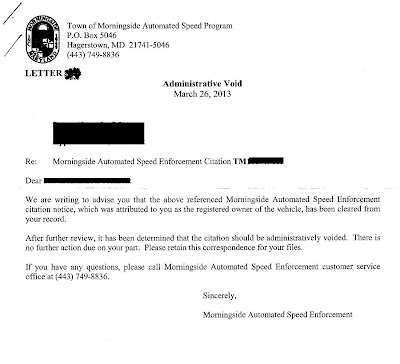 3) All correspondence (including letters, emails, and memos) exchanged between the Morningside Police and its speed camera contractor (Brekford) dated from 11/1/2012 through present, pertaining to ‘administrative void’ of speed monitoring system citations or requesting that speed monitoring system citations be voided or refunded. "Please be advised that the Town of Morningside is not the speed monitoring system operator as that term is defined in the Maryland Annotated Code, and, therefore, the Town of Morningside does not maintain the records and documents pursuant to your request." 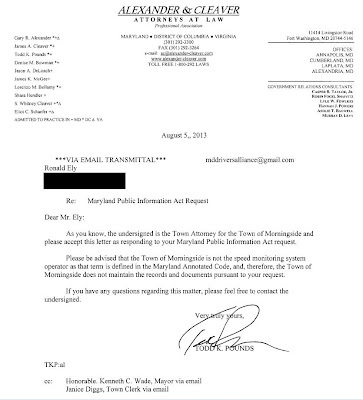 In a separate email, the town attorney also stated that "we do not have any of the documents that you are requesting especially since the cameras are managed through an outside entity". (iii) Shall be admitted as evidence in any court proceeding for a violation of this section. (4) (i) A speed monitoring system shall undergo an annual calibration check performed by an independent calibration laboratory. After the denial, we requested a copy of the town's speed camera contract, which Morningside did agree to provide. The document stated that the city pays Brekford corporation a 40% cut of collected ticket revenues, plus a $1.50 fee per ticket for the first 25,000 tickets. 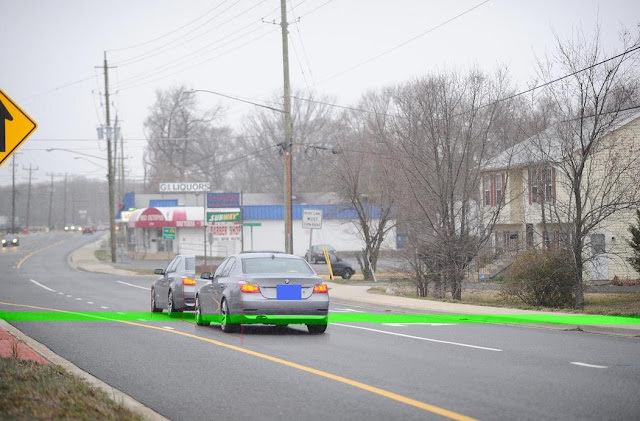 Maryland law contains the following provision: "(2) If a contractor operates a speed monitoring system on behalf of a local jurisdiction, the contractor’s fee may not be contingent on the number of citations issued or paid." However most jurisdictions do in fact issue contractors a cut of each ticket on the grounds that they claim the local government rather than the contractor "operates" the cameras. (Also, in Maryland local governments apparently don't have to follow the requirements of the law if they don't want to, because the state did not choose to include an enforcement mechanism). Morningside also claimed not to have any records or communications discussing the 'administrative void" of citations. Morningside's speed camera program has voided some citations. One motorist contacted us and provided a copy of a void notice he received after requesting a court hearing. Another citation received by the same motorist was thrown out in court because of insufficient evidence. The images of the citation dismissed in court is shown below. The vehicle was charged with traveling 50mph in a 30. The time interval shown between frames was 0.5s. For a vehicle to be traveling 50mph, it would need to have traveled 36.6 feet, well over 2 car lengths. In the voided citation, the motorist was charged with traveling 49mph in a 30. 'Cross Traffic' can clearly be seen moving at freeway speeds on the I-495 overpass in the same image. For a vehicle to be traveling 49mph, it would need to have traveled 35.9 feet in 0.5s. You judge: did this vehicle travel a distance equal to well over 2 vehicle lengths? Whether any of this poses a legal problem for Morningside has yet to be seen. 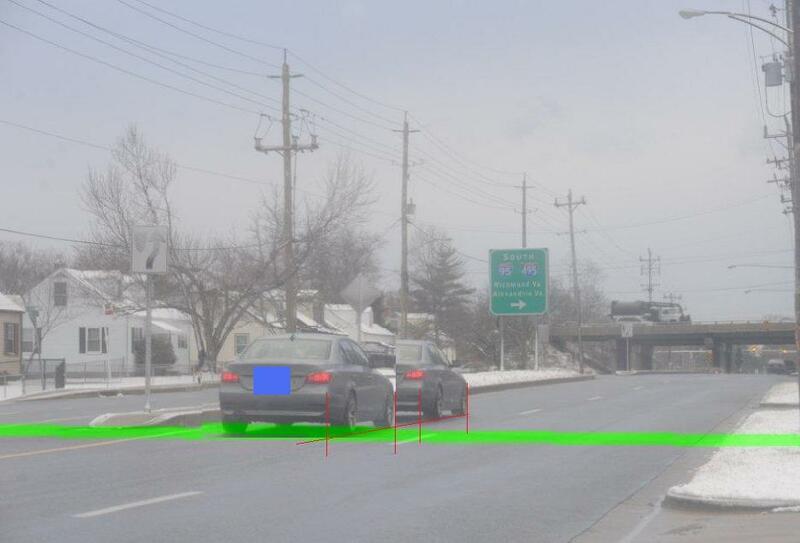 Local speed camera programs in Maryland enjoy a form of government immunity from most liability, and the requirements of Maryland's speed camera law do not have any enforcement mechanism built in. Thank the state lawmakers who created Maryland's speed camera law for that. However recipients of tickets from Morningside may seriously want to consider contesting tickets to avoid 'admitting guilt' by paying.